Now you can sing along with Elsa from the Disney's Frozen! By pressing the snowflake button on her chest, Elsa will break out in her signature song, "Let It Go", for girls to sing and dance to. As she sings, re-live the movie moment when Elsa flees the kingdom of Arendelle in search of a place where she doesn't have to hide her magical powers. 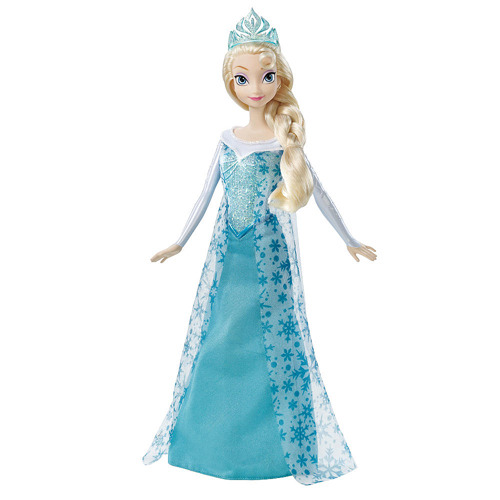 Girls can imagine that they have found their own winter safe haven where they can be themselves, just like Elsa. Requires 3x "AG13" button cell batteries (included). Ages 3 and up.